In addition to highlighting some new pieces today, I also thought it would be fun to just take a walk down memory lane…..but we’ll start with a couple of new necklaces. 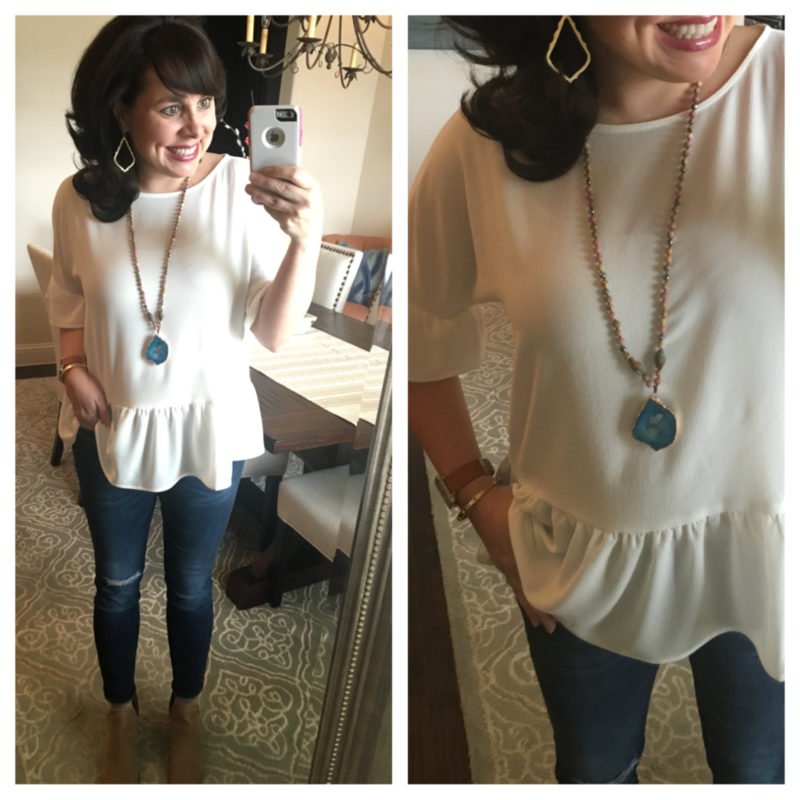 THIS necklace is an agate stone that is so popular right now, but it has a fun little twist with the chain going through it! It also comes in a gorgeous navy and a pretty gold and natural stone color. The agate stone is so pretty, and I think it’s a very unique piece for $45. (Remember, when you buy Treasure & Bond, Nordstrom will donate 2.5% of net sales to organizations that work to empower youth! I love that!) I’m also wearing MY FAVORITE EARRINGS EVER and the cross body guitar strap that I talked about a couple of weeks ago. 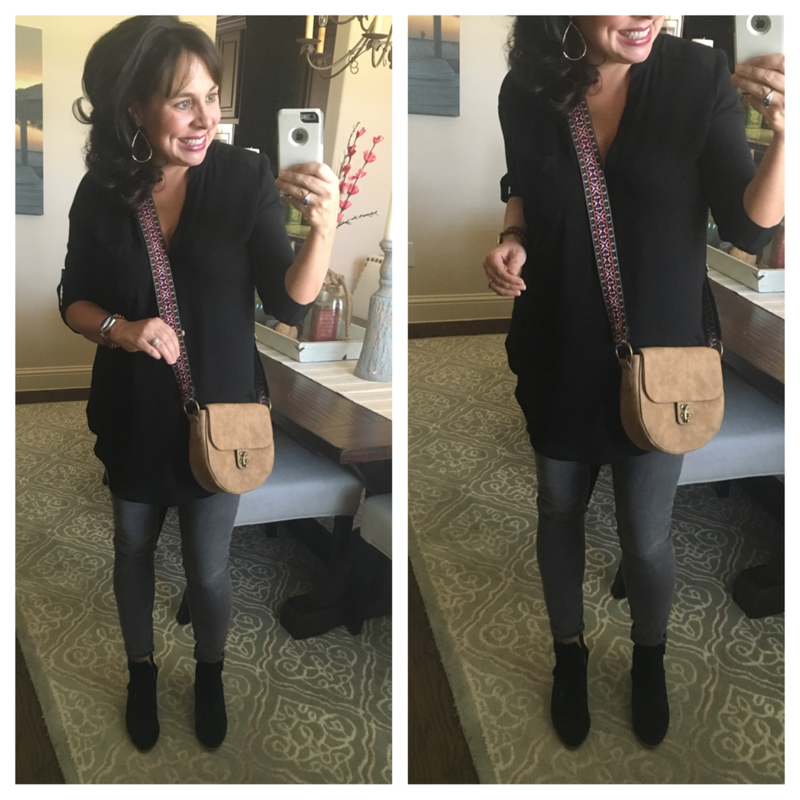 This strap basically gave me a new bag for under $50! So, look at the picture below, and imagine the outfit without any of the jewelry. 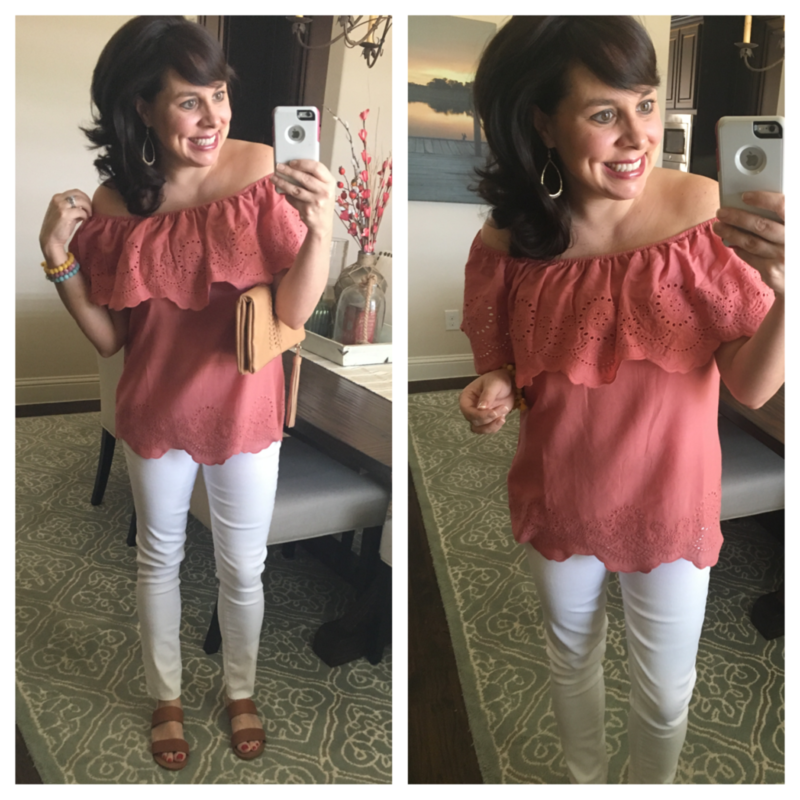 Even though I love the blouse, the jeans, and the flats….the outfit would be pretty boring without the accessories to really jazz it up! 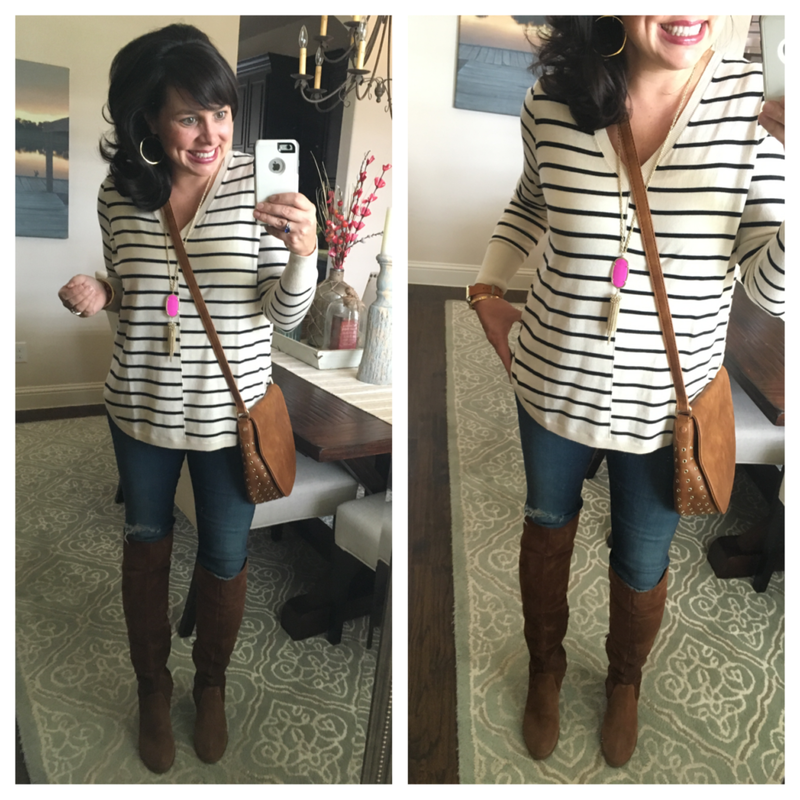 Blouse (small), jeans (27), and flats are all true to size. OH! 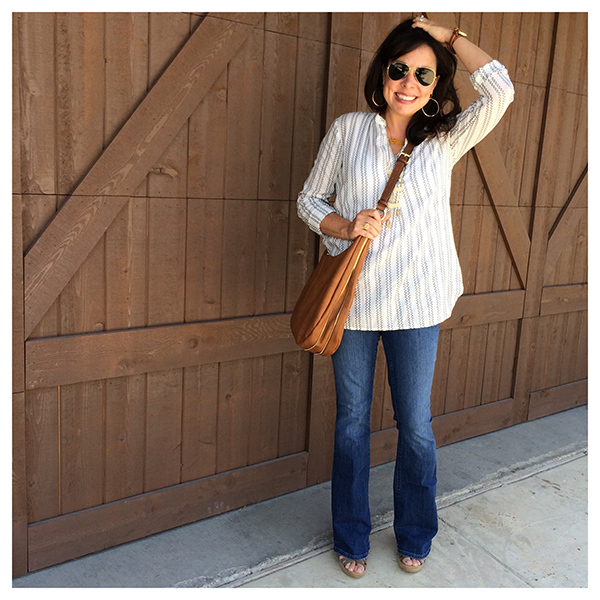 The blouse went 25% OFF this morning (which is great, because it’s expensive)!!! You might remember that I got this same blouse in white a couple of years ago. It became a wardrobe staple, so I got it in my black a couple of months ago! THESE EARRINGS are probably the most worn piece of jewelry I own. They are light as air, but their size allows them to still make an impact. They have a hammered finish, and I’m telling you, I reach form them at least 4 days a week every single week. If I had to choose only 1 pair of earrings for the rest of my life, you’re looking at them. AND THEY ARE ON SALE! They are worth every bit of $60, but they are an incredible deal at $45. Now, before we move on to more jewelry, let’s talk about THE JEANS for a second. I posted this on facebook at the end of last week, but I wanted it on the blog as well. 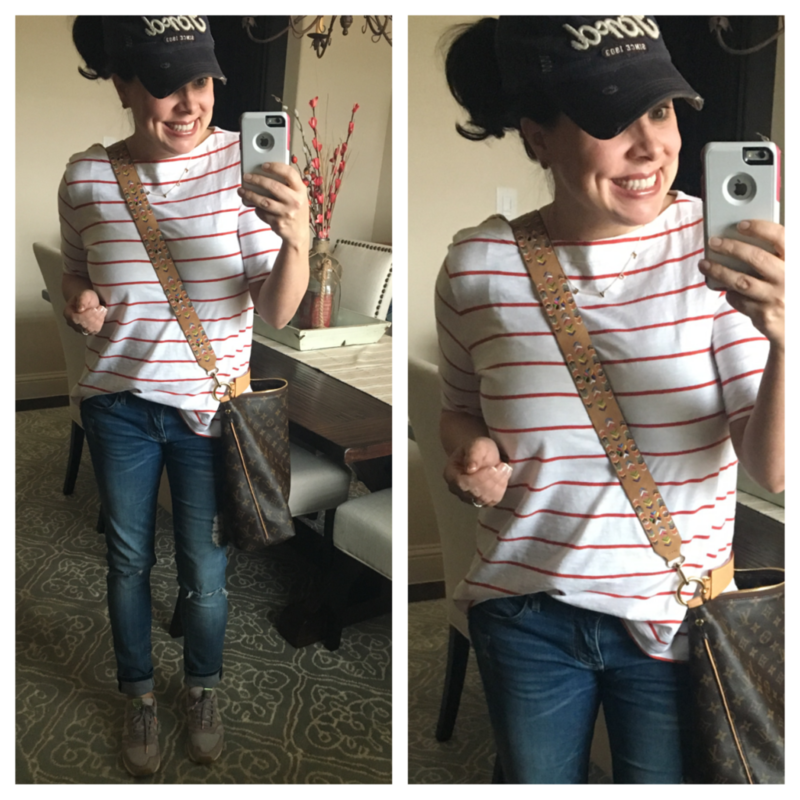 I received several questions on just how casual these particular jeans are that I have on (because of the frayed hem), and if I would only wear them with sneakers. Most of the time I’ll probably be wearing them with sneakers, shoreline converse (have you seen this new chambray pair?!? ), or even flip flops. However, I wanted to show you that they also can be dressed up a bit with flats, and I plan on wearing wedges with them as well. I’m wearing a 27, which is true to size for me…but if you are between sizes, I would suggest sizing down. If you still want more information, check out the full review from a couple of weeks ago! AND fyi: NOW THERE’S A DISTRESSED VERSION !!!!! I’ve received questions about the Articles of Society white jeans as well, and although they have great reviews, I personally don’t like them. I feel like they are too thin for white jeans. Hope this helps! Now for our walk down memory lane. 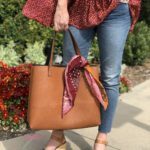 Let’s start with some SUPER AFFORDABLE AND FUN ACCESSORIES that you’ve seen on the blog before. These are items that I personally own and love. Many of these pieces are ones that you see over and over and over again on the blog! So if we’re talking bang for your buck, check out this leopard clutch. This baby adds some major sass to your outfit! And it’s ONLY $45! And the sunglasses are $12! These are both great spring and summer staples that you’ll be seeing again and again in the future. 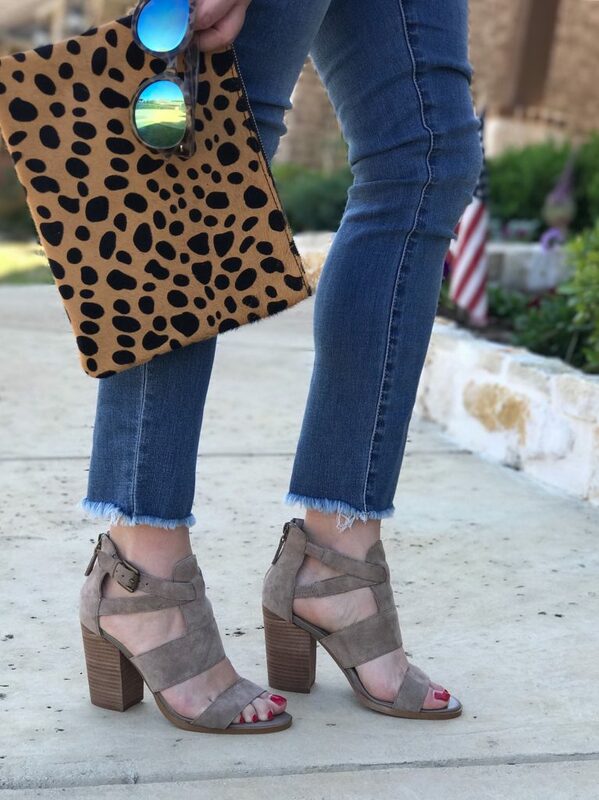 And the block heels are ON SALE for $59.90! Click HERE for the jeans. More of a tote girl? 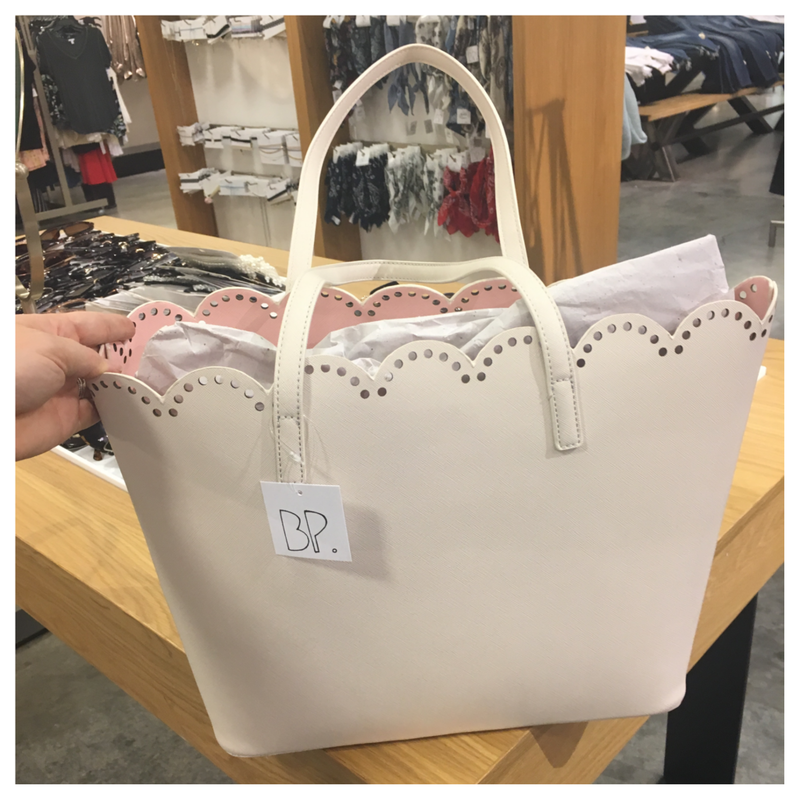 Well, THIS TOTE has scallop detailing, comes in 4 other colors, and is under $50 as well! Here’s another clutch that can really change the look of your entire outfit. Imagine this same look with just a plain black bag. NOT NEARLY as fun! Again, the jeans are true to size, and I sized up to a medium in the top. 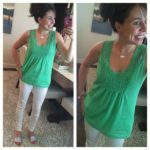 The 1 review of the top was not favorable at all, but I happen to love the top. The reviewer talked about the top being way too short, but at 5’4″, I didn’t find that to be a problem. 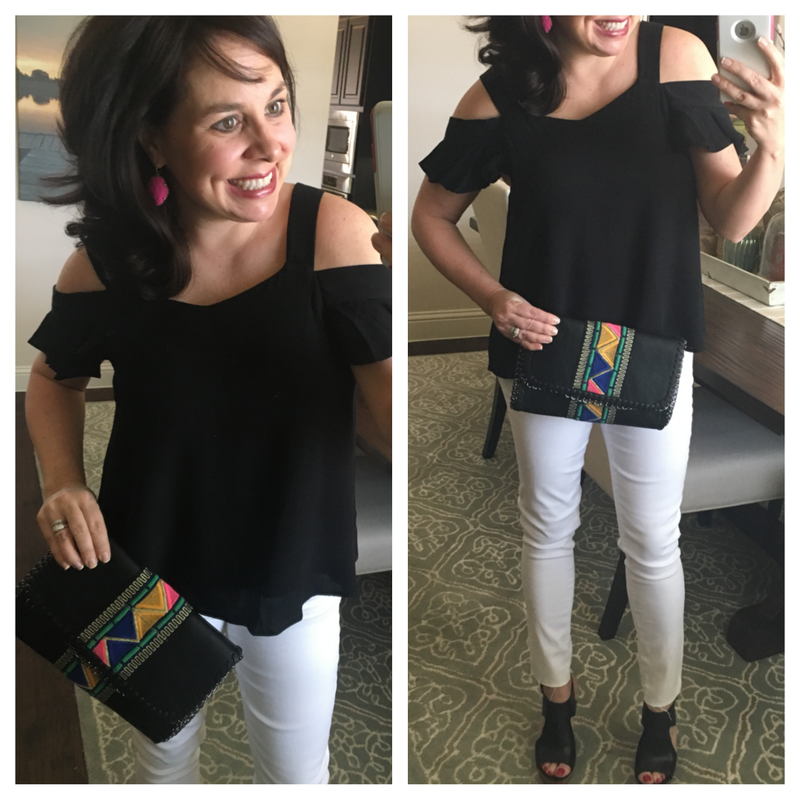 Pairing this black top with the white jeans makes it GO OUT ready! And the snazzy clutch seals the deal. These beaded teardrop earrings are light as a feather and only $20. And the neutral foldover clutch will go with pretty much every outfit and is only $39! I’m wearing a small in the top, so it’s true to size. This colorful circle pendant looks great with this chambray shirt, but it would also look awesome with colorful tees, and even a dressier type blouse! 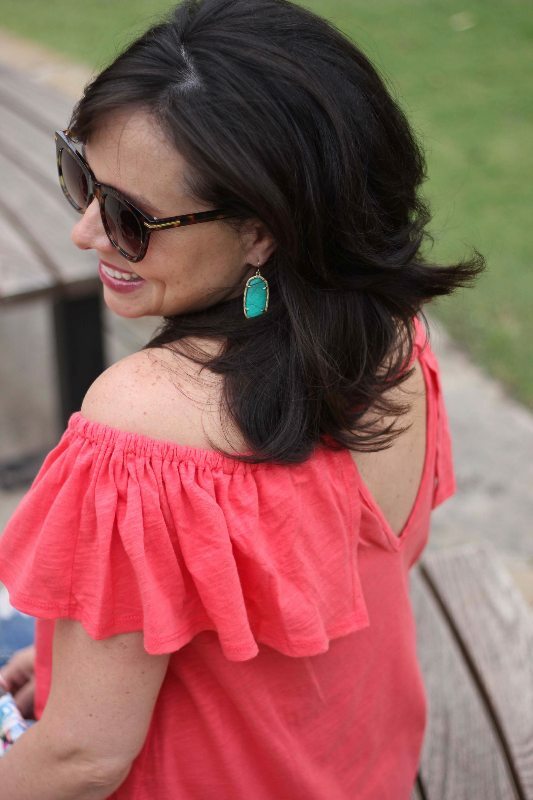 I love orange and turquoise together, and it’s a great buy at $32. And surprise, surprise….I’m wearing my favorite earrings again. And you’ll be seeing this cognac cross body a lot. The cognac color is gorgeous, and the ring and fringe are very on trend. And here’s a close up of the above necklace if you want a better look at the colors! And please notice my arm party. 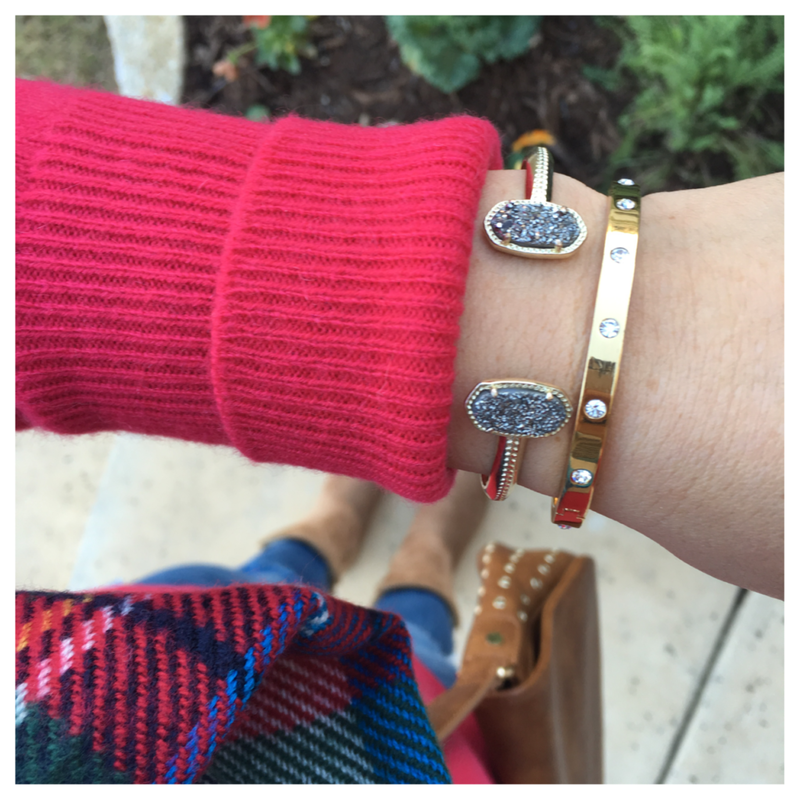 I’m wearing my favorite blingy bangle, and I’ve stacked it with this great brass and “leather” wrap bracelet. When talking about accessories, I couldn’t leave out my new guitar strap. Oh, and my LOVE necklace is very sweet and delicate, and it is ONLY $14 from the BP section! This next shot contains 3 very affordable accessories: the tote (I really love the contrasting leather strap and the neutral color combo), the peach crystal circle earrings (so delicate and such a pretty color), and the $14 bar charm necklace. And I absolutely love these snazzy hoops (same as above, but a different color). 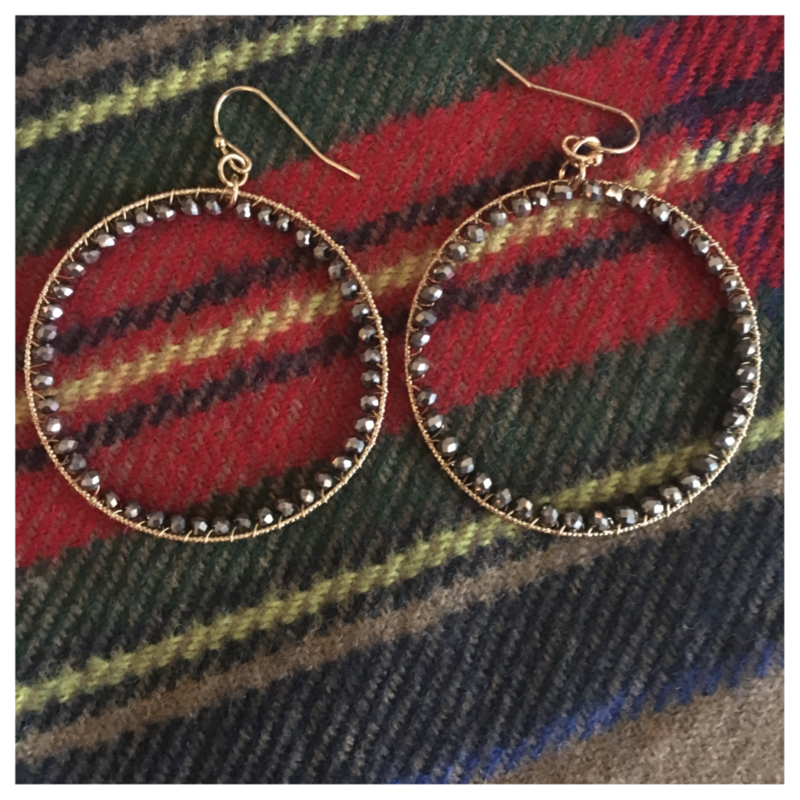 You’ve seen me wearing my Gorjana hoops for almost 3 years now….Well THESE have a similar feel if you don’t want to pay the money for the big dogs, and they pack an extra sparkly punch! They aren’t as big as the Gorjana hoops, but they definitely have a similar look for ONLY $18! I also picked up these teardrop babies, in an effort to help me not wear my Gorgana hoops ever dang day! 🙂 They come in gold AND silver, and they are only $25! 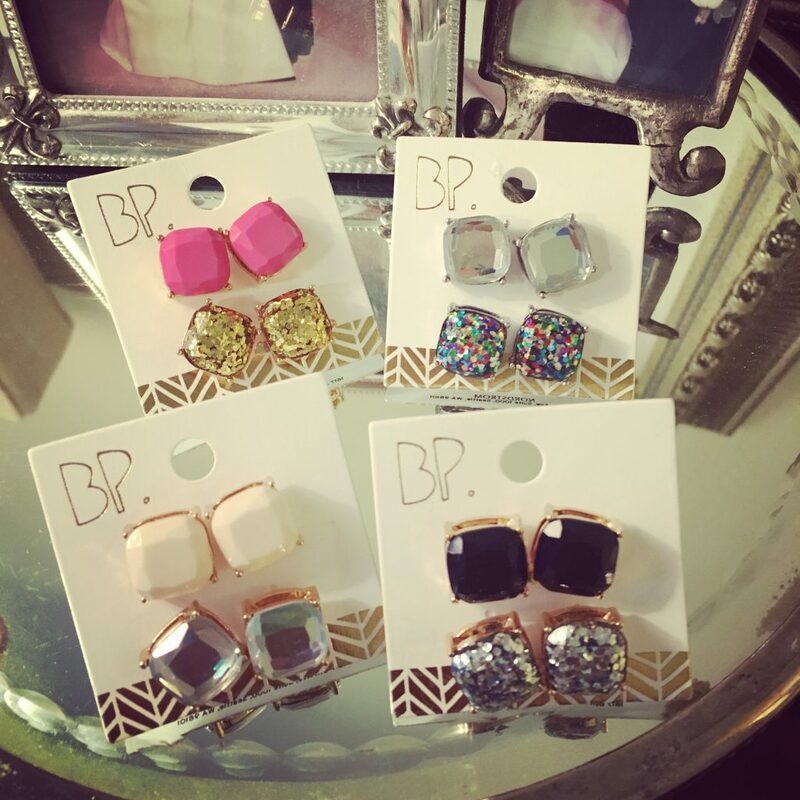 Click HERE for these WONDERFUL stud earrings that you’ve been hearing about for 2 years now. Well, now they are sold in pairs AND come on these darling little cards with the gold chevron detail. And y’all, we’re talking $9.98 a card. That’s just stupid!!! HELLO, FRIEND GIFTS, TEACHER GIFTS, and GIFT FOR YOURSELF BECAUSE IT’S MONDAY. I wear these all year long, but I especially love wearing them to the pool. These are obviously similar to the Kate Spade studs that everybody loves (I love them too), but these are so much less expensive! If these are too big for you, then you can always check out the mini Kate Spade studs, and I think you’ll be very happy with them. Here they are on, so you can get a better feel for the size. Now, let’s also talk about some of my TRIED AND TRUE pieces. These are items that you’ve seen on the blog AT LEAST 20 times each. Items that I’ve had for years that I continue to wear and love. And these pieces are all still in stock! I’ve had this Kate Spade blingy bangle for over 2 years now, and I still wear it all the time. It’s great on it’s own, and it’s also perfect for layering. It comes in gold, rose gold, and silver. Sadly, the other bracelet is now sold out…but it was only $15 and came from the BP Accessories Department. 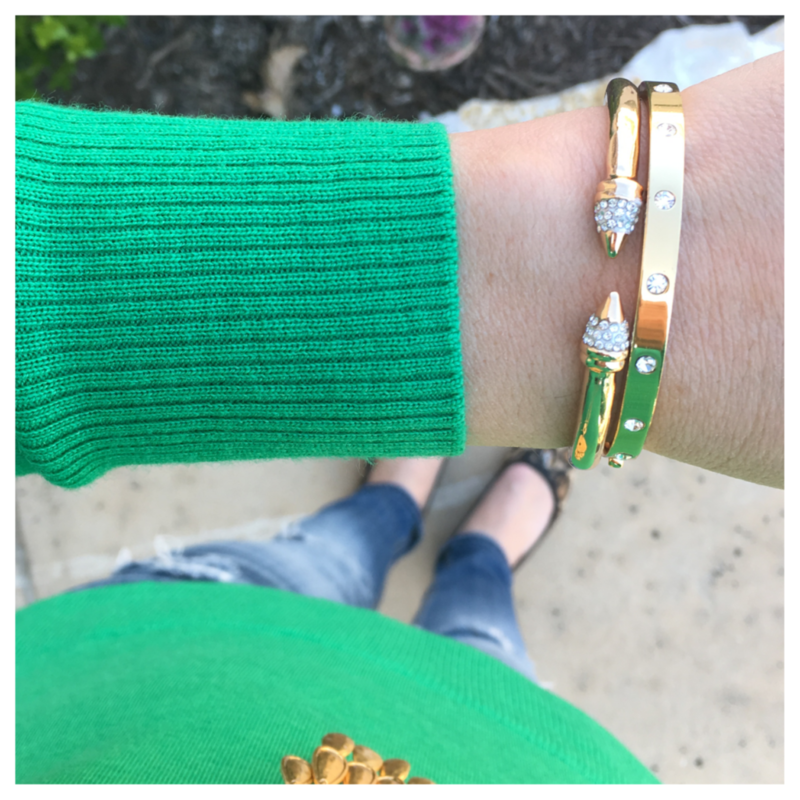 Here’s the Kate Spade bracelet again, paired with my other favorite bracelet. I wear them with both dressy and casual outfits. Also, they make awesome presents for 2 reasons: 1) you don’t need to know the recipient’s size, and 2) the person who gets one of these bracelets will most find themselves reaching for it several times a week. That makes for a great present! Here’s another shot of my dusy bracelet. I got THESE from my in-laws for Christmas this year. They have such a fun shape, and I know I will be wearing them for years to come. 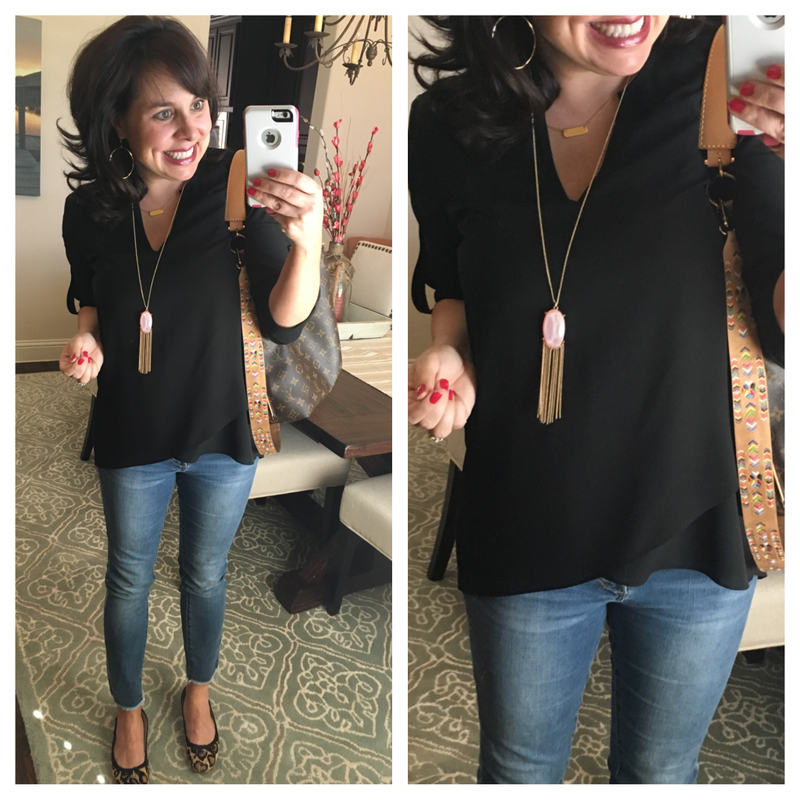 And I couldn’t do a jewelry post without mentioning the famous tassel pendant necklace. If you don’t have one, fix that. It comes in TONS of colors and would make a wonderful Mother’s Day gift. Another shot of this classic necklace in a dressier look. I absolutely love this hot pink, but I also love the turquoise and the brown mop (that’s a pretty golden color). And last, but certainly not least, these Kendra Scott Elle earrings are $55, and they are another definite favorite of mine. The Danielle earrings are a bit to large and heavy for my liking, but the Elle are just perfect. I have them turquoise, white, and abalone. Here are my turquoise ones! I hope you found some things you like, Heavens knows I’ve found some pieces for myself over the years (although several things shown today were gifts from loved ones for birthdays, Christmas, etc.). And not only does today’s jewelry make a great treat for yourself, most of the pieces make wonderful Mother’s Day gifts as well! 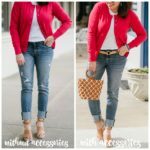 Thank you to Nordstrom for sponsoring this post! 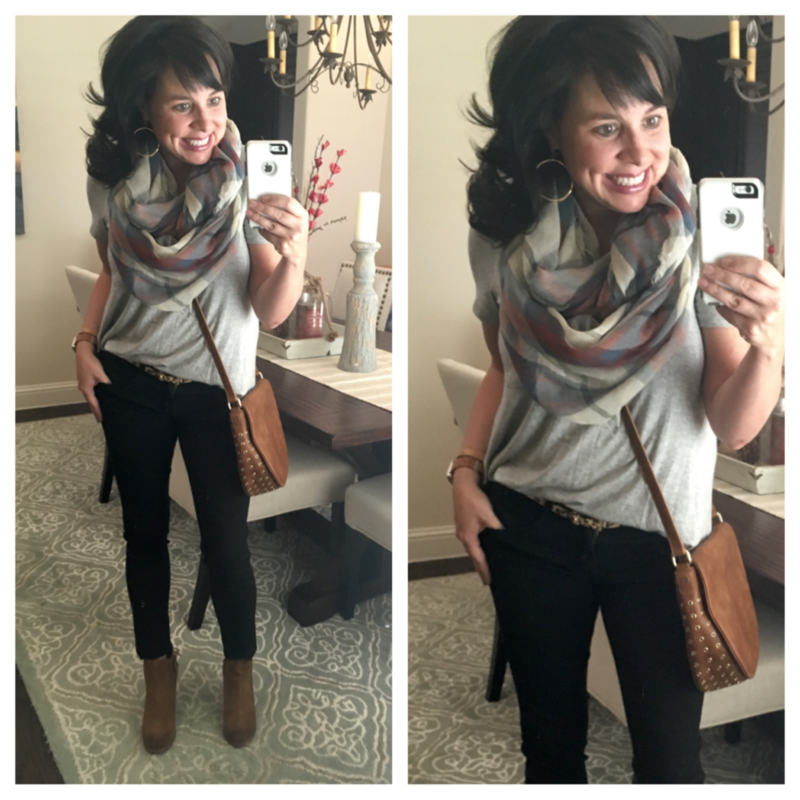 An Awesome Tee and Fantastic Jeans…and a FABULOUS Bag! 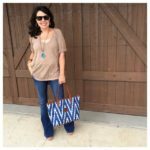 This post has me wanting to plan a fun night out just so I can order one of those CUTE clutches!! ALL THE HEART EYES for those clutches over here! Yes, yes, and YES to the accessories! You always nail necklaces and those hoop earrings are PERFECT! I love Norstrom’s BP Line so much and that scalloped tote bag is beautiful! I might have to pick that up soon! Oh my heavens! Accessories just make me happy, and you always find the best ones! Love it all!!! 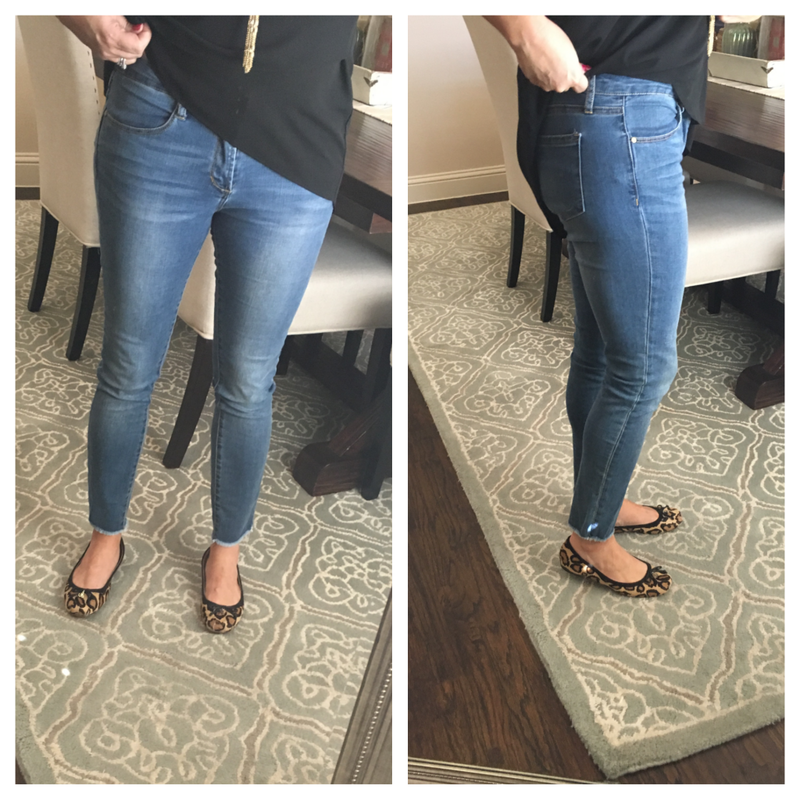 I just received the fray hem jeans and they are awesome! I was hestitant to buy them since I already have a pair of skinny light wash jeans. But glad I did, they will be my go-to pair! Thanks! Love it all – which LV bag do you have? It looks great with the strap! Hi, Susanna! The bag is several years old, and I’m having the hardest time remembering/finding it. We think it might have been called the Portabello? Love all the accessories! And totally agree with you on the Articles of Society white jeans. Tried them on in store and yes, they were too thin. Love all the jewelry!! I may have to snag those gold hoops! I have some similar in a bronze but I think I need them in gold! 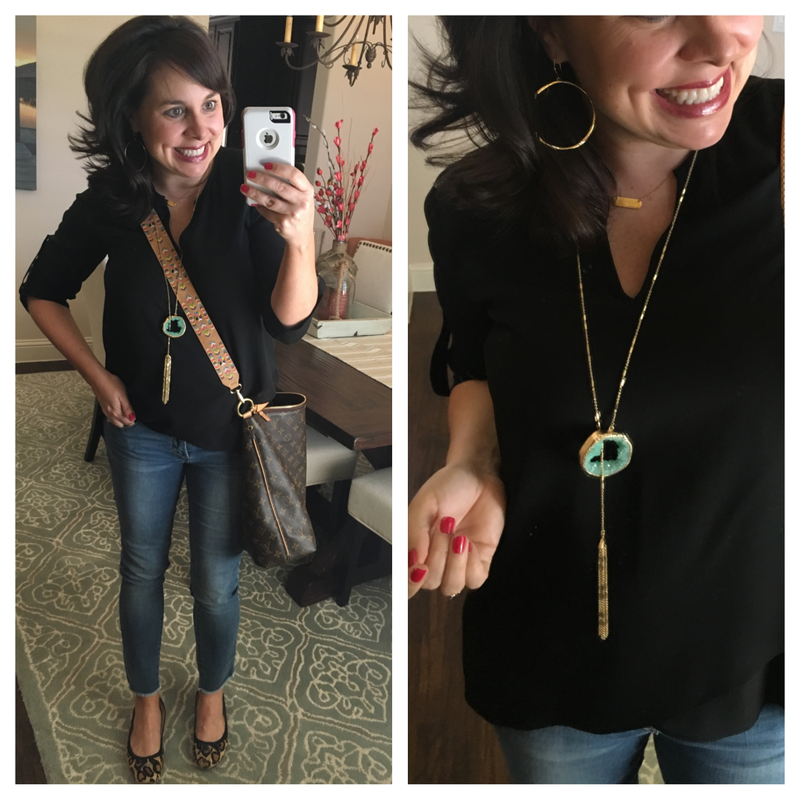 I’ve been obsessed with my Kendra Scott Sophee earrings lately! Always love the accessories you pick! 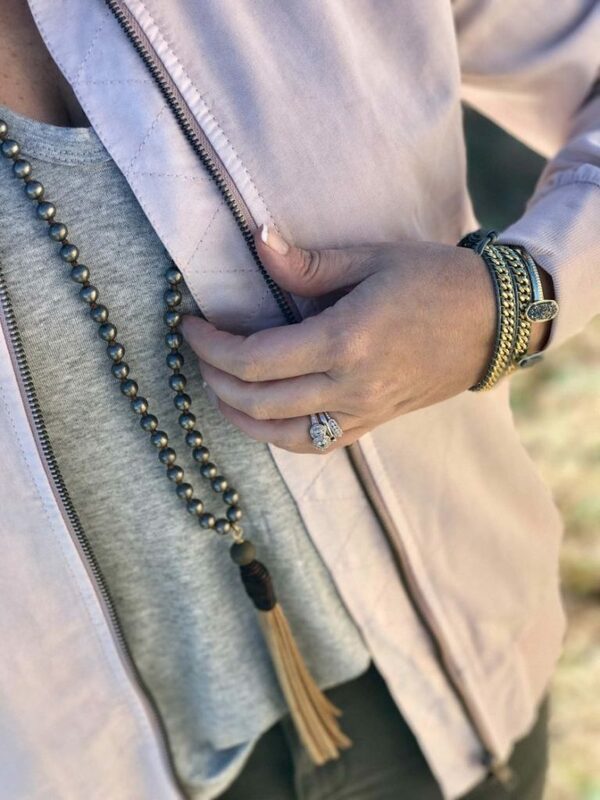 I have a question about the grey and gold wrap leather bracelet. I bought it and feel a little dumb, but I’m not sure how you fasten it. Can you please help? Thanks! Hi, Mary! You wrap it around, and then there’s a little round thing that goes through a loop. Does that make sense?!? What about your tiny gold necklace in top pic? Need it! =). Hi, Emily! 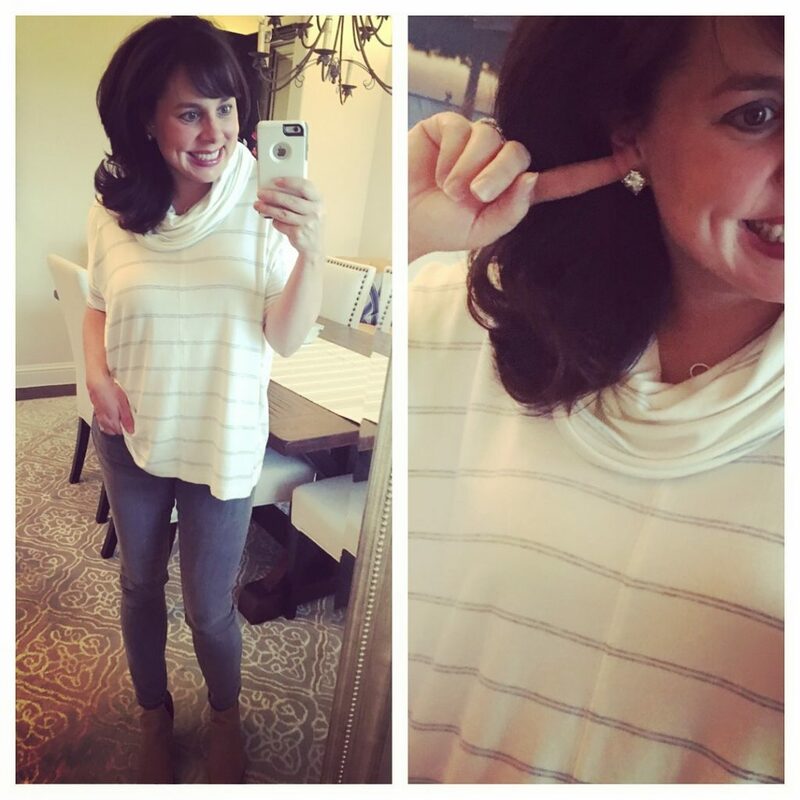 It’s the engraved bar necklace from Stella and Dot! And I LOVE it! 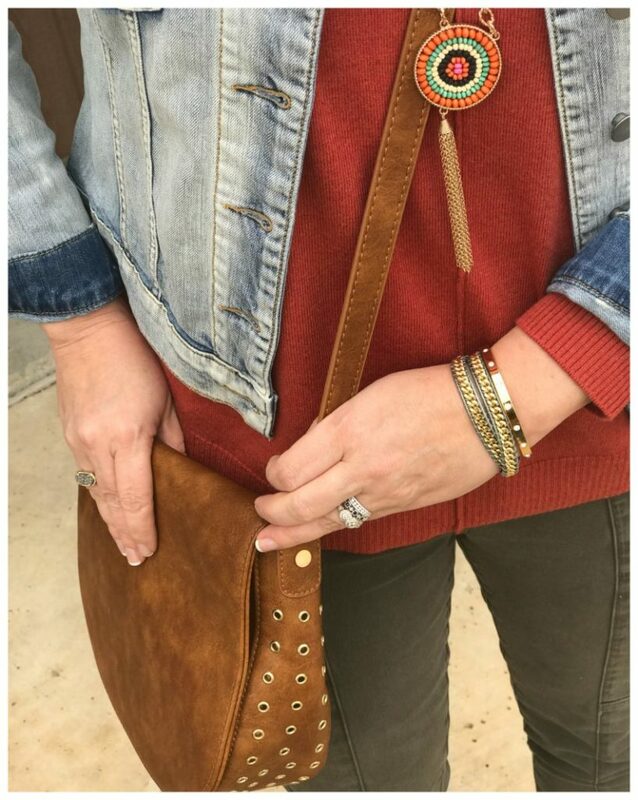 I want to find the bag in the close up of the circle pendant necklace! It’s so pretty! Do you remember where you found it? The Gorjana hoop earrings are 25% off! I just added them to my Nordstrom cart & they’re $45 instead of $60! Thanks for the necklace scoop! I was also wondering if you had the back of your asymmetrical blouse shortened. What a fun post! I especially love the stone fringed necklace… nice twist on this type of look. Yes a million times to all the accessories!! So many darling looks…pinning this whole post for all the great inspiration!! And I’ve said it before, but no one looks cuter in a ball cap, than you!! Just love love your blog!!! Is that black blouse the same as it shows in link? I only see white and I can’t tell if your blouse is longer in the back? I’m not talking about the must have blouse, similar to that one. Thank you!!!! Hi! 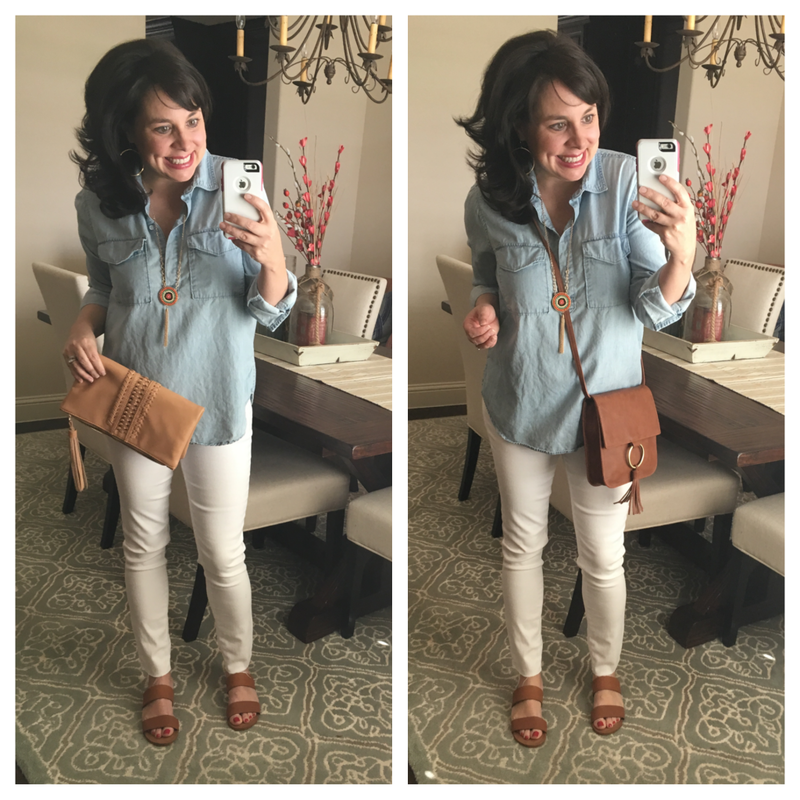 You are wearing another cognac crossbody (not the square one) in several pictures. Do yoi have a link for that or is it older? Thank you! 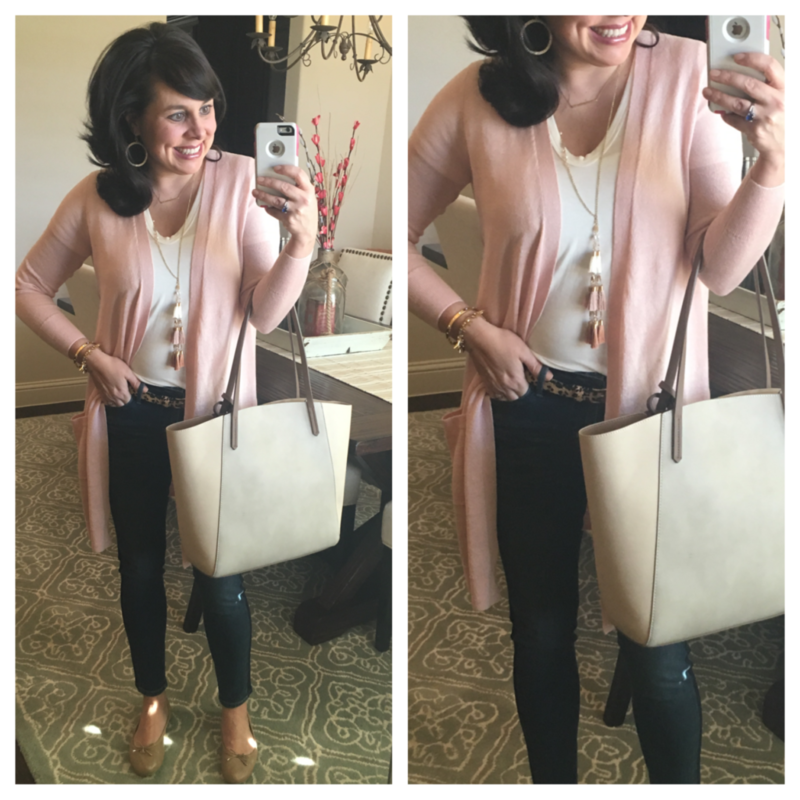 Great post with so many fun accessories! Do you know the brand of the white dress in the post with the jean jacket and colorful clutch? Is that colorful clutch available? Thank you!